The New Wave of Jazz is on Impulse! Impulse's mato rings true, I think the entire Impulse catalog is worth owning, they were one up and beyond the competition, in their day charging a dollar more then the others. Many artists did their best work for the label. "The House That Trane Built" by Ashley Kahn explains it all. 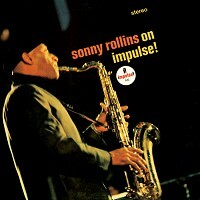 This Rollins is particularly well recorded with Sonny's horn right in the center and every musician displayed prominently with Booker's bass right beside the saxophonist, Bryant's piano on the left and Roker's traps on the right. Van Gelder was prolific, unfortunately not all his stereo efforts are as top rated as this. Don't miss it.